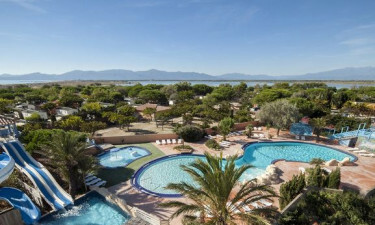 Camping Club Mar Estang is a leading LUX-camp that can be found in the enchanting Perpignan region of France. Sun worshippers are sure to feel right at home here, as it is possible to stroll to the beach in just a few minutes from a rented mobile home, while a large selection of activities and entertainment options are provided right on the side for those who do not want to venture far from this impressive luxury camping site. What Makes Camping Club Mar Estang So Special? A large number of classes are offered to guests who want to try something a bit different during their camping holiday. The aerobics classes are the ideal way to get fit, while dance classes are designed to help visitors put a spring in their step. People who are new to some of the sports available onsite are also offered special lessons to help them get into the swing of things. Bicycle tours are organised by the staff at Camping Club Mar Estang and this is the perfect way for families to explore the surrounding area while getting fit and having fun. Bicycle hire is also available for those who prefer to explore the area independently and there are some great sandy lanes and seaside roads to drive along complete with plenty of places to pause to soak up the atmosphere. Guests will also be able to enjoy a special evening entertainment programme, which is designed with the interests of the whole family firmly in mind. In addition to sitting and sipping a drink or two, guests will be able to dance up a storm at the onsite disco. Guests will never have to venture far from the beach thanks to the excellent snack bar and supermarket that can be found right on site at Camping Club Mar Estang. Guests will be able to put together a picnic to enjoy on the sand in next to no time, while the snack bar also serves a large selection of hot light bites for guests to choose from. The main supermarket also stocks other items for families to use on the beach such as balls and other games and reading material.